Best known as a globe-trotting television personality, chef Eden Grinshpan studied at London’s Le Cordon Bleu before landing not one, but two shows on the Cooking Channel, one being Top Chef Canada. And just over a year ago, Grinshpan added one more hat to her impressive collection of “toques blanches”: mom. Grinshpan says her one-year old daughter, Ayv, will eat anything—as long as it’s topped with one special ingredient: “My daughter is obsessed with anything that’s covered in tomato sauce, so I’m always thinking about different dishes that can incorporate it,” she says. As a result, she spends a great deal of time brainstorming the next spaghetti-inspired dish to satisfy the youngster’s cravings. One of her tried-and-true, kid-tested recipes? 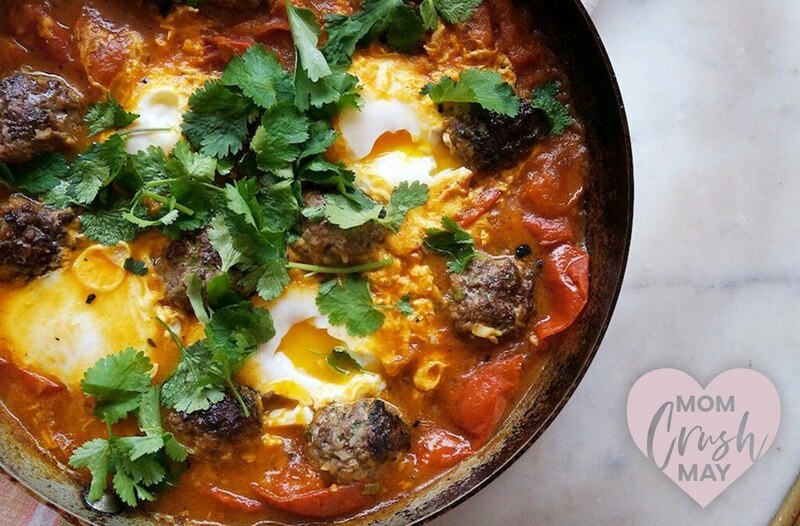 A simple, yet impressive lamb shakshuka. Grinshpan, who is opening a new fast-casual Middle Eastern restaurant called Dez in New York City’s Nolita neighborhood later this month, shares this quick and healthy recipe adapted from the menu. Promise: It’ll knock chicken fingers right off your weekly meal rotation. Serve this dish family-style on top of rice, flatbread, or another grain of choice. In a bowl, combine the lamb with the shallot, parsley stems, ginger, garlic, cumin, cinnamon, and season well with salt and pepper. Mix together and roll into small even balls. Heat up the two tablespoons of olive oil in a large skillet and place the balls in, approximately one to two minutes on each side until they have some color. Shake the pan to flip over (Tip: you don’t want to cook them through; just color them). Remove when they are golden, approximately two minutes. In the same pan you made the lamb meatballs, heat up two more tablespoons of olive oil. Add in the onions and season well with salt and pepper. When they are translucent add in the garlic, coriander, turmeric, and tomatoes. Season with salt, pepper, and a pinch of sugar. Cover and let simmer on medium heat for 25 minutes. Remove the lid and check for seasoning. If sauce seems thin, uncover and let the sauce reduce. Place the meatballs into the sauce, cover with the lid, and let cook for two minutes. Remove the lid and place the eggs into little wells you make with a spoon. Cover again and let cook for three minutes until they are set but still runny. Recipe courtesy of Chef Eden Grinshpan, Chef and Co-Founder of DEZ. For more expert and real-mom-approved parenting intel to use in the kitchen and beyond, dive into Mom Crush May.